After announcing Humanz, their first album in six years, on Thursday, Gorillaz have shared a new video for "Saturnz Barz." 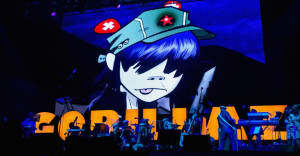 The video, directed by Gorillaz co-founder Jamie Hewlett, features the Popcaan-assisted track, as well as previews of three other songs from their upcoming album. Four new tracks from the album premiered on Thursday. "Saturnz Barz" featuring Popcaan and "Andromeda" featuring D.R.A.M. both premiered on BBC Radio 1; "We Got The Power" featuring Savages’s Jehnny Beth debuted on Radio X, and "Ascension" featuring Vince Staples debuted on Beats 1. The songs will all be featured on Humanz, which is due out on April 28. The three additional tracks are now available to stream below. Also, check out the "Saturnz Barz" video in 360-degree VR and the full tracklist for Humanz.